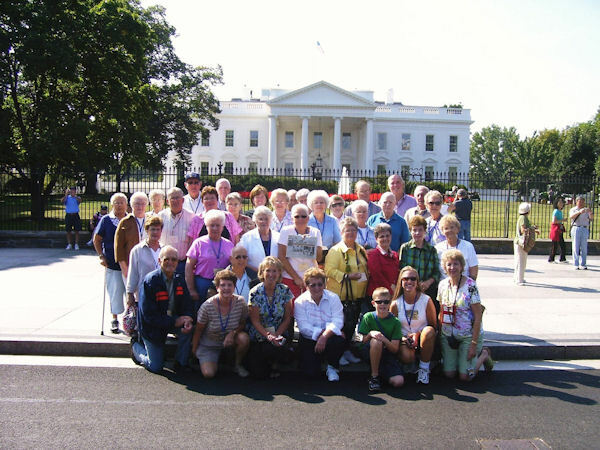 In September this group of travelers from around the Heartland left Stronghurst and Took The Quill Along for points of interest in Washington D.C. They visited the Capitol Building, Kennedy Center for the Performing Arts, Gettysburg, Air Force Memorial, World War II, Korean and Vietnam Memorials, Tomb of the Unknown Soldier, White House, Lincoln Memorial, and other points of interest. The tour was under the direction of "Do Travel" of Monmouth. Sammy Blender of Raritan is holding "The Quill." (We're down to our last Take The Quill Along so please, remember to take your Quill when you travel).